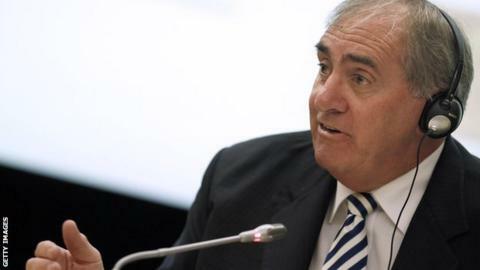 Football must do more to combat drugs cheats, according to the president of the World Anti-Doping Agency. Arsenal manager Arsene Wenger this week called for blood tests to be brought in by UEFA to fight doping. And Wada president John Fahey has highlighted a need for increased testing of the blood-boosting drug EPO. He said: "I simply say this about football - they are not testing enough for EPO. They can do more and we encourage them to do more." "The fundamental principle of the Athlete Biological Passport is based on the monitoring of selected biological parameters over time that will indirectly reveal the effects of doping rather than attempting to detect the doping substance itself." The Australian was talking at Wada's media symposium in London and emphasised that finding drug users in sport is not just about testing more frequently. "Again, use intelligence, not just more tests," he said. "While testing is a good deterrent factor and may be an effective way of catching people, I would argue the athlete biological passport is a very effective tool. Why isn't football using it? "But I also recognise all of this costs money and I suspect some sports have got capacity to do it more easily than others and I can only encourage sports to see why this must be a priority to ensure the integrity of their game." Sepp Blatter, the president of football's world governing body FIFA, tweeted: "Followed some key comments from @wada-ama media symposium today. Look forward to meeting WADA delegation in Zurich on Thursday." The subject of doping has come to the fore recently, with the case of disgraced cyclist Lance Armstrong followed by revelations of widespread cheating in Australian sport. And Fahey says that WADA will deal with any facts that are presented to them. He said: "We're not in the business - and nor is any anti-doping agency - of reacting to rumour. You obviously have to be careful with the information you get. "On the other hand, on a daily basis we get frequently anonymous information at our headquarters and we ensure the appropriate body is given that information to follow up. "So we don't ignore it but one has to work on facts and it is not unusual for a losing team to blame something other than the ability of themselves for the reason for their defeat so you have to be a little bit careful and work on the facts."